This is a great summer grain bowl to make with vegetables from the garden. We had tomatoes and cucumbers that my husband grew this summer, and added avocado and bacon as our other toppings. But, this would also be great with sweet corn, shredded chicken, bell pepper, or whatever else you think of! The buttermilk dressing is super delicious -- tangy like ranch, but more fresh-tasting. You can substitute chives or another fresh herb for the scallions if you like, although I am currently totally obsessed with scallions. This recipe is excellent for a light dinner, but also makes good lunches, either as leftovers or prepped in advance. If making for cold lunches, you may want to swap out the bacon (which will lose crispiness) for something else such as shredded chicken, hard-boiled egg, or steak. Summer Barley Bowls: Top cooked barley with tomatoes, cucumber, avocado, and crispy bacon. Drizzle with buttermilk-scallion dressing. We have green beans from our garden! I can't claim any credit (my husband does all the gardening), but they sure are delicious. Although I usually roast green beans, it was fun to try something different with this recipe. They're a little spicy, a little nutty, and all around tasty. My 7-month-old daughter also enjoyed some (before we added the spicy sauce). We served the beans with roasted salmon and this biscuit recipe, made with lemon zest and scallions in the dough and za'atar sprinkled on top before baking. 1. Stir together the soy sauce and chili garlic sauce in a small bowl and set aside. 2. Heat the sesame oil over medium-high heat in a non-stick skillet. Add the green beans and cook for 6-10 minutes (depending on size), stirring occasionally. Add the scallions when the beans are a few minutes away from being done. 3. Remove from heat, and toss with the sauce mixture and the sesame seeds. This sauce is tangy, creamy, and awesome on nachos. And, it couldn't be any easier -- no cooking, just whizz everything together in a mini chopper or similar. Because it has avocado, it's best served right away -- but the acid from the tomatillos and lime juice will keep it fairly fresh overnight too. Here, it's on nachos with chorizo, black beans, cheddar, and tomatoes from our garden. Combine all the ingredients in a mini chopper, food processor, or blender and blend until smooth. Taste and adjust for seasoning. These ground pork patties are super juicy and full of flavor from ginger, lemongrass, and jalapeno. Their richness needs crunchy veggies as a fresh pairing, but you can use anything you have on hand -- no need to stick to the ones I had in my fridge! Pile everything on top of steamed rice. Perfection! 1. Stir together the cilantro, ginger, garlic, lemongrass, onion, jalapeno, and salt. Add the ground pork and gently combine with your hands. Separate into 10-12 small balls, and flatten each into a small patty. 2. Heat oil in a nonstick skillet over medium heat. Add the pork patties and cook for about 3 minutes on each side, or until cooked through. 3. Serve the rissoles over rice, with salad for crunch! This is a delicious and flexible way to use summer produce from your garden or the farmer's market. Stone fruit like nectarines or peaches pairs really well with toasted cornbread croutons, and we added tomatoes, basil, and cucumbers from the garden. Of course, there's no need to be strict with this ingredient list! A friend's family makes artisan cured pork, and we happened to have some of their coppa on hand, which topped the salad perfectly -- though this would also be wonderful as a vegetarian dish if you prefer. Red Wine Vinaigrette: Whisk together 1/2 cup vegetable oil, 1/4 cup red wine vinegar, and 1 T Dijon mustard. Season to taste with salt and pepper. Cover and set aside. Cornbread Croutons: Preheat the oven to 400 degrees and line a baking sheet with foil. Spray generously with oil. Cut cornbread into cubes. Arrange in a single layer on the baking sheet, and season with salt and pepper. Spray with more oil. Bake until nicely browned, 10-15 minutes. Let cool. To assemble the salad: Pile lots of summer produce in a bowl -- we used cucumber, nectarines, basil, raspberries, and pear tomatoes. Add the cooled croutons, and toss with the red wine vinaigrette. Top with coppa or prosciutto. We have a major overabundance of cucumbers in our garden right now! We shared some with a friend, and she in turn shared this excellent recipe with us. "Smacked cucumber" sounds a little strange, but it is really delicious with wonderful flavor. Perhaps our cucumber was on the small side, since I had about twice as much sauce as I needed; I simply saved it and will make the recipe again this week. Makes for a fantastic side dish alongside stir fry. 1. Lay the cucumber on a chopping board and smack a few times with the flat blade of a sharp knife or a rolling pin. 2. Cut lengthwise into four pieces, and scrape out seeds if there are lots of seeds. Cut the cucumber into diagonal slices. 3. Place the cucumber in a bowl with the salt, toss to combine, and set aside for 10 minutes. 4. Stir together all the other ingredients in a small bowl. 5. Drain the cucumbers. Add about half the sauce, and stir to combine. Taste and add more if you like, or save to make the recipe again later -- will depend on the size of your cucumber. These scones are a wonderful use for fresh raspberries -- the berries become soft and jammy in the oven, sandwiched between tender scone dough. These scones aren't very sweet, so the sanding sugar on top is key. Like all scones, these are best eaten as soon as possible and don't keep well. 1. Preheat the oven to 350 degrees and line a baking sheet with parchment or foil. Spray with oil. 2. Whisk together the flour, sugar, and baking powder. Cut in the butter. 3. In a separate bowl, whisk together the egg, buttermilk, and vanilla. Add gradually to the dry mixture, stirring gently with a fork, until incorporated. Chill 5-10 minutes. 4. Divide the mixture into two and pat into two circles about 9-inches around. Cover one disk with the berries, and top with the other disk of dough. Pat down gently. 5. Cut into 8 wedges and transfer to the baking sheet. Brush the scones with milk or beaten egg (or a combination), and sprinkle with sanding sugar. 6. Bake about 20 minutes, until nicely brown on the bottom. I found a huge container of blueberries at Costco, so I knew I wanted to bake something tasty with them. I found this recipe for blueberry crisp and it was perfect -- super easy to prepare and bursting with juicy blueberries. The topping is sort of like crumbled oatmeal cookies sprinkled all over the blueberries - yum! I made this for our 4th of July barbecue, and it would be great for any gathering. Leftovers make an excellent breakfast. 1. Preheat oven to 375 degrees. Make the filling: Mix blueberries, sugar, cornstarch, lemon juice, and salt in a bowl. Transfer to an 8-inch square baking dish. 2. Make the topping: Stir together flour, oats, baking powder, and salt. Cream butter and sugar in a mixer until pale and fluffy. Stir dry ingredients into butter. Using your hands, squeeze topping pieces together into clumps. 3. Sprinkle topping evenly over filling. Bake until bubbling in center and brown on top, about 1 hour. Transfer to a wire rack, and let cool for 30 minutes before serving. One of the best parts of owning a home is that we now have a grill in our backyard! This steak is super flavorful and delicious, and is easy to prepare. The recipe makes more avocado butter than you'll need, but it keeps well in the fridge and makes for a killer toast-topper! Make some grilled bread on the side for a great accompaniment. 1. In a medium bowl, stir together the butter, avocado, lime juice, jalapeno, coriander, and a generous pinch of salt. Mix well, cover with plastic wrap, and store in the fridge until ready to serve. 2. In a small saucepan over medium heat, stir together the olive oil, garlic, brown sugar, chili powder, 1/2 tsp kosher salt, and several grinds of black pepper. Stir until the sugar dissolves, about 2 minutes. Let cool slightly, then rub all over the steak. Let sit for 15-30 minutes. 3. Prepare a medium-high grill. Grill the steak, flipping once, until medium rare (about 4 minutes per side, 8 minutes total). Transfer to a cutting board, smear with a good amount of the butter, tent with foil, and let rest 5-10 minutes. 4. Slice the steak against the grain and serve with the remaining butter. Grilled bread is fantastic on the side! Tomatillo salsa: Husk and rinse about a pound of tomatillos. Place in a pot with half a jalapeno (more for spicier salsa). Cover with water and simmer until tender. Use a slotted spoon to transfer to a blender. Add about 1 tsp minced garlic, 3/4 tsp cumin, and 1/2 tsp kosher salt. Blend until smooth, taste, and adjust seasoning. This frittata is the perfect one pan breakfast-for-dinner. It's got all your major food groups, and makes the perfect meal with toast on the side. Plus, leftovers are awesome cold the next day! Feel free to switch around the ingredients based on what you have in the fridge -- this is a great way to use up odds and ends. 2. In a medium bowl, whisk the eggs and milk until frothy. 3. In a large ovenproof skillet, heat a drizzle of oil over medium-high heat. Add the chicken sausage coins and brown them on all sides, 4 to 6 minutes, turning often. Transfer the sausage to a plate until ready to use. 4. Add more oil to the skillet if needed and heat until shimmering. Add the shallot and 1/2 tsp of salt. Cook, stirring often, until softened. Add the garlic and cook, stirring, for about 30 seconds. Add a splash of water to the skillet and then stir in the spinach and the remaining 1/2 tsp of salt. Stir for about 2 minutes, until the spinach is wilted. 5. Spread the spinach filling evenly and top with the chicken sausage. 6. Pour the egg-milk mixture over the frittata filling and use a silicone spatula to scrape the sides of the pan and gently pull eggs from the edges toward the middle so that soft curds form and the frittata begins to firm up. Sprinkle the cheese on top. 7. Transfer to the oven and cook until the eggs are set, 5-7 minutes. 8. Sprinkle with pea shoots or fresh herbs, then slice into wedges and serve with toast. My mom and I made this dip on a recent trip back to Ohio. It's super flavorful and delicious, plus pretty healthy too! The recipe makes a ton, so this is a great choice for a crowd. Make sure to have lots of pita chips for dipping. Heat a drizzle of olive oil over medium heat in a large skillet. Add 1 cup chopped walnuts and a small diced onion and saute until the onion is softened. Add a good amount of minced garlic and saute until fragrant. Set aside to cool slightly. In a medium bowl, stir together 2 cups whole milk plain Green yogurt, a few handfuls chopped fresh spinach, a bunch of chopped fresh mint, and the juice of one lemon. Season generously with salt and pepper. Stir in the walnut-onion mixture. Taste and adjust seasoning. Serve with pita chips or fresh veggies for dipping. I've never tried pasta in the Instant Pot before, but I have to say I really love this recipe! Since everything cooks in one pot, it's quick to make and cleanup is also super easy. The flavors go really well together and the sauce is so creamy and savory. Plus, it's the perfect use for the overabundance of basil from our backyard garden! 1. Put the chicken broth, sun-dried tomato pesto, Italian seasoning, and garlic into the Instant Pot insert. Whisk to combine. 2. Add the chicken and pasta and stir to combine. 3. Seal and cook on high pressure for 5 minutes. 4. Quick release the pressure, and add the baby spinach, cream cheese, and Parmesan cheese. Stir to combine. 5. Replace the lid, and let sit 5-10 minutes for the sauce to thicken. Taste, and add salt and pepper as needed. Between the pesto and cheese, I didn't think mine needed any additional salt. 6. Stir in the basil just before serving. These vegetable pancakes are a great way to use up summer zucchini, and make for a delicious light dinner with salad. The yolks of the soft-boiled eggs make for a really tasty sauce for the pancakes, but a yogurt or avocado sauce would also be fantastic. Leftovers are good warmed up in the microwave the next day for lunch -- I had mine with half an avocado. 1. Squeeze the zucchini over a strainer to remove excess liquid. 2. Combine the flour, baking powder, salt, and several grinds of black pepper in a large bowl. Add the shredded zucchini, grated cheese, and scallions and toss to coat. 3. Crack the egg into a liquid measuring cup. Add enough milk to make 2/3 cup. Add to the flour-zucchini mixture and gently combine to create a thick batter. 4. Heat an electric griddle or non-stick skillet over medium-low heat. Spray with oil. Scoop 1/3-cup portions of the batter and spread to form pancakes about 1/2-inch thick. Cook until golden brown on both sides, about 9 minutes total. 5. Serve with halved soft-boiled eggs, sprinkled with za'atar. This is one of those recipes I've been wanting to make for a long time -- maybe because the name sounds so interesting! I definitely should have made muhammara sooner, because it's very easy and also very delicious. It's similar to hummus and could be used pretty much anywhere you would serve hummus, but with walnuts and roasted red peppers as the main ingredients. We enjoyed it with guests at Thanksgiving, with lots of different fresh veggies for dipping. Toast the walnuts in an oven at 350 degrees or in a dry skillet for about 5 minutes, until fragrant and lightly browned. Set aside to cool for a few minutes before processing. Place the walnuts in the bowl of a food processor and process until the nuts are well chopped. Add all the remaining ingredients (starting with the smaller amount of breadcrumbs). Process until smooth. Add more breadcrumbs for a thicker dip, and adjust salt, lemon juice, and red pepper flakes to taste. Keeps 1 week in the fridge. 1. Whisk the yeast into the milk and set aside. 2. Whisk together the flour, sugar, and salt. Cut in the butter (as for a pie crust). 3. Separate the eggs. Cover the egg whites and store in the refrigerator. Beat together 1-1/2 egg yolks, and then mix into the flour mixture. Reserve the extra egg yolk in the fridge. 4. Add the milk to the flour mixture and combine well. Place in a covered bowl and chill overnight. 5. The next day, separate the dough into two equal parts. For each part of the dough, roll into a rectangular shape about 12 inches long and 1/4-inch thick. 6. Beat together about 3/4 of the reserved egg whites. When the egg whites are very foamy, beat in the sugar and cinnamon. 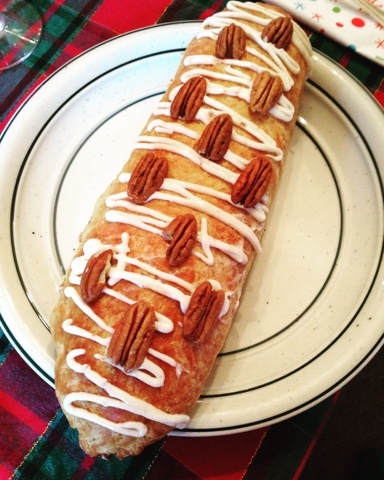 Spread half over each piece of pastry, and sprinkle half the pecans over each. Roll up like a jelly roll, pinching the ends and seams to seal. 7. Place seam-side down on a parchment-lined baking sheet. Let rest 1 hour. 8. Whisk the reserved egg yolk with 1/2 T water and brush on the coffee cakes. Bake in a 325 degree oven for 40 minutes, until lightly golden. Cool on a wire rack. 9. Whisk together the frosting ingredients and drizzle over the coffee cake. For a neater presentation, you can place in a Ziplock bag and cut off the corner. Arrange whole pecans on the frosting before it hardens.